Trumpet shaped single and double flowers bloom in many shades of cream, yellow, orange, red, blue, purple, to nearly black with vivid contrasting gold veins. The patterns created by the overlaying veins give the flower a stained glass appearance. 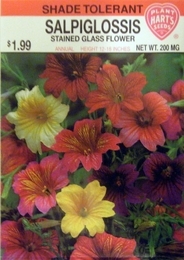 Salpiglossis will grow in full sun during the cooler weather but prefers some shade during the heat of a summer afternoon. Lightly fragrant flowers, good cut flower, or container plant. Planting time - indoors 6-8 weeks before last frost date. Thinning - when plants are 3 inches tall thin to 3 inches apart.